Those pores! Those eyebrow hairs! The robot uprising is upon us. 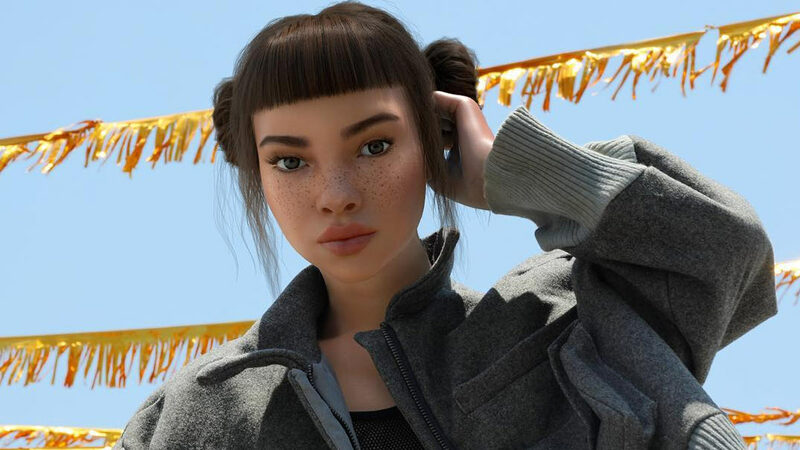 Whether you've noticed it or not, computer-generated "digital influencers" have slowly been infiltrating your Instagram feed since April 2016, when Lil Miquela, a Brazilian-American "pop star" who wears Supreme and captions her images with social-justice hashtags like #BlackLivesMatter, posted her first photo. She now has 1.3 million followers. Since then, many others have cropped up, like Trump-supporting avatars and teal-skinned aliens—and, perhaps most notably, Shudu, "the world's first digital supermodel," a character by visual artist Cameron-James Wilson whose follower count has more than doubled since March. One glance at her pics is enough to make you question whether she really is real—She has pores! Errant eyebrow hairs! Tiny little wrinkles! A generally human-like vibe!—and then ask a bunch of follow-up questions about how and why all this happened. Shudu was designed to be in her mid- to late-20s and from South Africa. Her name, popular with the Ndebele people of that country, was chosen by an early follower from the area who messaged Wilson to congratulate him on his realistic portrayal. She has 130,000 followers on Instagram—impressive for an account that only has 27 posts and...oh right, doesn't feature a real person. But Shudu presents as a dark-skinned woman, and Wilson, a former photographer who has shot Gigi Hadid, is a 28-year-old white man from the U.K. Since he came forward as Shudu's creator in February 2018, Wilson has received backlash on his account and in the press, criticized for the idea that Shudu could take away work from real models of color, that she's a way to work with black women without "working with" black women, and that it's wrong in the first place for him, a white man, to represent a black woman online or to profit from her. Speaking to us, Wilson admitted that there were problems in the way he initially represented Shudu, including peppering her posts with culturally appropriative hashtags he originally used to boost her following. "I had never really considered hashtags as something very personal to people—I thought you throw them on anything," Wilson admits. "I made a point to change them and to make my hashtags very specific to what Shudu is about. Now, they're all very much 3D and CGI—things like that." He claims he's never actually profited from Shudu and that his only goal is to bring more diversity to the fashion and gaming spaces. He sees himself as a painter, albeit with an imaginary woman as his subject. "If we want to talk about robots taking away jobs, and I think that's important, I think we need to look more at every day jobs that are going," he says. "The supermarket—each one of those self-service checkouts was the job of a person once." Wilson uses software called Daz-3D to create his images. "It's not taken very seriously in the digital industry, because it's seen as much more of a hobbyist program," Wilson says. "But I think it's a very, very powerful tool." The process of creating a character from scratch requires meticulous attention to detail. "I start with a standard model with very, very blank features—almost like a mannequin," Wilson says. "You work from there to add features [like specific nose and eye shapes] and make subtle changes to create a character. You can change absolutely every aspect of this featureless base to create some really, really beautiful and striking characteristics." This process can take as long as two or three days. "After you've built your character, you then have to paint them—it's called texturizing. You can add skin and things like that," Wilson says. Adding makeup is similar to painting skin. For this project, we asked Sir John, who has worked with Khloé Kardashian, Chrissy Teigen, and Beyoncé, to create a beauty look specifically for Shudu. "I take Sir John's sketch and Shudu's face texture, and I start to paint onto the skin, following the face chart and the makeup," Wilson says. "It's on a flat surface, so it looks very strange." For this, Wilson kept the background minimal—just a simple, bright yellow-orange—so he could keep the focus on Shudu's gorgeous skin and makeup. "The most difficult aspect in getting Shudu right is often the finer details. Things like the eyes are very, very difficult," he says. "You don't realize that so, so much of what makes us look alive and there is in the eyes and how they reflect the light. You have to constantly be adapting and changing little things just to make sure that they look real." Wilson sees CGI modeling as a future avenue for real-life models to book multiple gigs at the same time—or to save real, physical work for jobs that pay more. In Wilson's version of the future, Kendall Jenner could get her whole body scanned, and after agreeing to appear in an ad or an editorial shoot, an entity could "pose" her and "style" her digital form to fit their needs, according to a contract. Wilson says this even has the potential to extend models' careers past their heydays. "The famous quote is, 'I wouldn't get out of bed for less than $10,000 (P529,800, for reference) a day,'" Wilson says. "What if you didn't even have to get out of bed at all?"